The major strength of the Barb/Arch army is its very low cost and fast production speed. This make it ideal for farming for Elixir as the cost to produce the troops is so low. It is also a great strategy to employ when you have a fair amount of free time and can attack very frequently. However, its greatness strength also leads to its weakness, which is that as a low cost and fast army it is also moderately weak on attack and can be wiped out by bases with strong splash damage. A common strategy with the Barb/Arch army is to take out the main splash defence (usually Mortars) with Lightning Spells before attacking. If you are going to employ this strategy it is best to decide to do this straight away, as generally if you leave it until halfway through the battle it is too late and half your troops are already gone. The Barb/Arch army excels at attacking just collectors for loot. If the collectors are on the outside you can drop a few barbs, or if they are behind walls you can use some archers. Generally it takes about 5-10 archers to take out a collector (depending on levels) and it is a good idea to drop them in an arc around each collector so that a mortar or wizard tower doesn't take them out all at once. 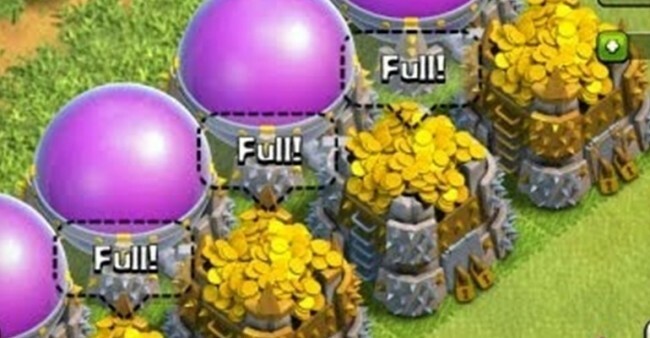 The best bases are ones where all the collectors are in a line on the outside - you can actually drop less troops per collector because the defence fire will be split between the entire line of troops and will take them down slower. You can also, however use the Barb/Arch army to attack medium strength bases with full storages. The tactic is to drop a line of barbarians first and then follow up with a line of archers behind them. You spread all the troops out to make them less susceptible to splash damage (from Mortars and Wizard Towers) as these are their biggest threat. Don't drop all your troops at once, release them in waves of Barbarians and then Archers behind so that they don't cluster up. It is generally a good idea to focus on one side of the base only, as splitting up your attack strength will actually expose you to more fire at once and will reduce your overall effectiveness. Remember the primary goal of Barb/Arch is speed and efficiency - so if you don't need all your troops, or if dropping more will not get your much more loot then save them for the next attack! The BAM Army is a variation of the Barb/Arch where you add Minions in to speed up troop creation time by utilizing the extra Dark Barracks. BAM does cost some Dark Elixir to produce so it isn't ideal for farming Dark Elixir, however it can be great for speeding up attack frequency and getting you more Gold and Elixir. As with the Barb/Arch army, it is often used in combination with Lightning Spells. As with the Barb/Arch army the primary strength is the low cost and fast production time, however the addition of the flying Minions also makes the combination great for attacking bases with poor Air Defence or low level Wizard Towers. The two biggest weaknesses are the overall susceptibility to splash damage and in particular with BAM some people are not a fan of the Dark Elixir cost. As with Barb/Arch the BAM Army is great for attacking just collectors - in particular the flying minions provide a way to easily take out collectors that are only protected by Canons, Mortars or Ground Targeted X-Bows. Sometimes you can even just use 1 minion to take out a collector. The tactics for attacking storages is similar to the Barb/Arch combo, however with the addition of minions it is possible to attack on the side with the Air Defence and/or Wizard Towers on the edge and take them out fast so that the Minions last longer and can decimate the rest of the base unopposed. Attacking from one side is also a good idea with the BAM Army - however sometimes if there are exposed Air Defence on the other side of the base it can enhance the attack if you take them out too. The WAGG army is one of the most common farming armies for lower townhalls (it isn't anywhere near as effective from townhall 9 and up). Goblins are the main force behind this army, however they can be supplemented with Giants (as Meat Shields) and Wallbreakers (to assist in looting harder to reach storages). The essence of the WAGG army is to get to the collectors and storages as fast as possible and loot them before the defences can take down your goblins. Giants can be used to distract the Mortars and Wizard towers long enough for the Goblins to do their thing. If Mortars are far enough away from the Goblins then often the Goblins will move fast enough to be missed by the Mortar shots. The strength of the WAGG army is its ability to just target loot, it is a fast build, low cost army where you can use minimal troops to achieve maximum loot. However the weakness is that it is harder to maintain a certain trophy level with the army because you will rarely be able to win battles with it. In addition High level Wizard towers will decimate Goblins easily so they need to be distracted with Giants. The best targets are ones with full collectors outside the walls, or storages that are all grouped together - even better if the splash damage coverage from the Mortars and Wizard towers are poorly placed or low level. The Healer/Giant strategy is based around using the Giant's high hit points to attract all the fire, using the Healers to make the Giants last longer and using the Giant's Defence targeting to take out Mortars and Wizard towers before they destroy your lower level troops. The general army composition is to use 8-20 Giants, 1-2 Healers, 0-12 Wallbreakers and the rest a combination of Archers, Goblins and/or Barbarians. The Healer/Giant Army is a bit slower and a lot more expensive to make than the previous combinations, however it is very versatile in that it can target a wider variety of bases and has more capability to take down stronger bases with better protected storages. It is not a good combination for hunting for Elixir due to its high cost. The biggest weakness of the Healer/Giant army is its susceptibility to well placed spring traps as they will fling your giants away and leaves you with nothing to 'Heal'. Apart from this, the only other real weakness is the cost and time to make, however bases with medium to high level splash defences that are well segmented will be much harder to take out. One of the huge advantages of the Healer/Giant combo is its versatility. You can use it for collector raiding by just dropping the Archers, Goblins or Barbarians as in the Barb/Archer army, or you can target more heavily defended bases. You can also drop just a few giants and/or wallbreakers as in the WAGG strategy for medium level strength bases. When raiding entire bases (ie: storages and collectors) it is best to look for bases with all their splash defence in one wall enclosure - the more spread out the splash defence are the harder it is for your giants to attract all the fire. 9. Use your extra 20-30 archers to target any extra storages or collectors that have lots of loot and have been missed by the main group - alternatively use them as backup for the giants if your main group is destroyed.